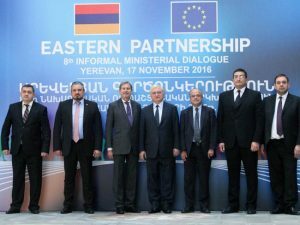 On 17 November 2016, the EaP CSF participated in the 8th Eastern Partnership Informal Ministerial Dialogue, represented by Hovsep Khurshudyan, member of the Steering Committee. In his address, Hovsep Khurshudyan stated that “the civil society of the Eastern Partnership countries, has been the main driving force behind the struggle of the peoples of these countries for democracy and human rights” and stressed the need to tackle pressing issues such as the high level of youth unemployment and the persecution of civil society activists in the region. The meeting gathered Ministers of Foreign Affairs from the six EaP countries, EU officials, including Commissioners Johannes Hahn (European Neighbourhood Policy and Enlargement Negotiations) and Carlos Moedas (Research, Science and Innovation) and Deputy Secretary General of the European External Action Service Jean-Christophe Belliard along with representatives of CSOs from the EaP region. The discussions mainly focused on the implementation of the renewed European Neighbourhood Policy, enhancing the effectiveness of the EaP in the framework of the next Eastern Partnership Summit (scheduled for November 2017 in Brussels) and current international security issues concerning the region.